The Pop Culture League Challenge this week is a simple one: Top 10! I immediately started thinking of what I could rank. Transformers? Maybe, but I couldn’t narrow it to ten, in all likelihood. Godzilla movies? An intriguing thought, but I already have another post brewing regarding the King of Monsters. Maybe something about comic book superheroes? Again, same problem as Transformers: where do I start? So, without further delay, here are my choices for the Top 10 seasons of Power Rangers! When I first saw the suits for this season, I thought wow, capes! It’s like superheroes! Next, I saw the Megazord with the wizard hat, and thought nope, that won’t work. Then I actually watched the show, and it turned out fine. The magic themes were a total Harry Potter ripoff, but I like Harry Potter, so it was cool. Mashing spells and magic formulas up with PR elements was a good fit. This show also had one of the best bad guys ever: Koragg, the Knight Wolf, who turned into a centaur Megazord! The first totally new set of Power Rangers, and also the biggest budget for any season ever. The big draw here, for us, was the Magna Defender. His costume was awesome, his anti-hero attitude was unique, and he could grow to huge size and drive his bull-shaped Megazord. My son dressed up as Magna Defender for Halloween, and later wore the suit out from playing in it. Another fun memory was the long series of new episodes that aired on weekdays during the fall. Coming home after school and watching new episodes of Power Rangers together with my kindergartner curled up next to me was wonderful. Power Rangers had been in a long term slump before this came out. The two series preceding it, Samurai and Mega Force, were both two years long, and also terrible. Then this season, based on the classic dinosaur theme, appeared and made up for six years of bad shows. The acting is much better than the norm, and it’s a large Ranger team which I always enjoy. The only negative is the Megazords, which have a sort of superdeformed look I don’t particularly care for. However, there are tons of them, and they are all prehistoric creatures, so it’s hard to complain! Many fans will disagree with me, but I really liked this season. The Megazords are among the best toys the line has ever seen, with tons of interactivity and play value. The Supertrain Megazord, especially, looked fantastic, and it was gigantic, too. The sixth ranger for this season, Ryan, the Titanium Ranger, was the first American-only Ranger ever, and his story arc was interesting. The demonic villains were quite creepy, almost too scary for my kiddos at certain points in their development. I loved the season-long interplay between Green Ranger Joel and his crush, Miss Fairweather. Too many Zords? Maybe, but who cares when each one is totally cool? We enjoyed this show so much I ended up importing all the major toys from Japan just to have them in the proper scale. That may seem silly to some, but when daddy loves giant robots and the kids show those puppy dog eyes, well… I’m a sucker. The characters were fun, especially the mentor and eventual Purple Ranger, RJ. The best part, though, was the set of three new Rangers created just for the American market: Shark, Elephant, and Bat Rangers! Amazing villains, too. Not much to complain about with this one! In college, I worked at an after-school program. When Power Rangers began airing, it immediately became a “drop everything and watch” activity. I enjoyed the show with 30 or so kids every day and thought “wow, it’s like real life Voltron, but with dinosaurs!” I was hooked. The formula had gotten a bit stale towards the end of season 1, but then the new season came out and changed everything. New Zords! New villains! Tommy lost his powers, then regained them, becoming a new Ranger color in the process! The Thunder Megazord is one of my favorites, to this day. This season set the bar high for the rest of the series to follow. My sons were 4 and 11 when this came out, so both of them were totally into it, and as a dad, that meant I was totally into it too! This may be the best cast, top to bottom, of any season. We particularly loved the hilarious Green Ranger, Bridge. There was a uniformity to the design of the Megazords that looked great and was quite appropriate for the tech police theme. 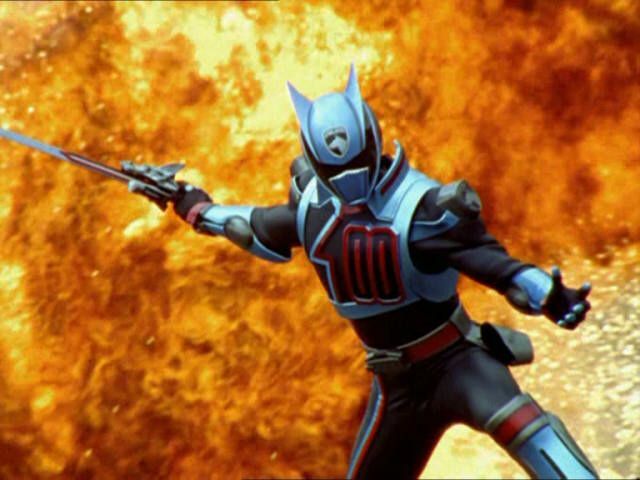 This season also has my favorite Ranger of all time, the Shadow Ranger. His costume was totally sweet, all steel blue and black. He had the best fight scene in PR history, where he took out 100 minions in one minute. Topping it all off, he was a dog-headed alien. What more needs to be said? This series was the one airing when I started dating my wife-to-be and her 3 year old son. Introducing him to the show is one of my fondest memories. This was the end of the continuity heavy Zordon era, and it went out in style. The “evil Ranger” theme is one that is oft repeated, but it was never handled as well as with the Psycho Rangers. The spaceship themed Megazords were slick, and truly stood out compared to their predecessors, which were mostly animal based. One of the best PR villains, Astronema, tops it all off, making this season stand up well against the best the series has to offer. The series makes a triumphant return to its prehistoric roots, and it was wonderful. Fan favorite former Ranger Tommy came back as the series mentor. When he finally suited up again as the Black Ranger… it was goosebumps all over. The Zords were fantastic, probably the best animal-based forms across the whole series. Zeltrax, Elsa, and Mesogog were menacing villains, very fun to watch. Additionally, the two lead male Rangers were named Connor and Ethan; these are my youngest son’s first and middle names. The episode “Fighting Spirit”, where Tommy has a vision in which he fights his previous alter egos, is a delight. I also enjoyed the episode where the Rangers watch a “Japanese ripoff” of their own exploits. Deliciously meta! This one stands head and shoulders above the rest. A team of police from the future travel back in time to hunt down an escaped mutant terrorist. The best Pink Ranger ever, Jen, is the team leader, and she is awesome. There’s an intriguing season long romantic subplot between Jen and Wes, the modern-times Red Ranger, who looks suspiciously like her dead boyfriend from the future. Time travel wasn’t emphasized as much as I would like, but there are still some “fix the timeline” shenanigans. The Quantum Ranger (who is also Red! Two Red Rangers? Sweet!) was a particularly interesting sixth ranger, far more mercenary than you’d expect from a kids’ show. He also piloted a giant silver and red Tyrannosaurus, which is one of the best Zords ever. The Time Force Megazord was a quadruple-changer, extremely unusual, having two different humanoid robot forms and a giant jet mode as well as the individual ships. This series is more what I would now call “CW style”, but this totally worked. Time Force remains unsurpassed among Power Rangers seasons. 20 Years Before 2000 has 80s commercials! Two Minute Toy Break has cool G.I. Joe accessories! Dino Thunder and In Space are by far the best of the bunch IMO, so I can respect them at two and three. What I’ve seen of Time Force wasn’t as impressive, so I might have to dig deeper into that one of these days. It really is worth a look. So much great stuff going on. You were dating your wife to be AND her three year old son? Hmm…. It was a package deal, you know what I mean.